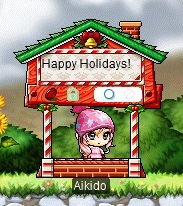 [Update] Cash Shop Update for December 27 | Dexless, Maplestory Guides and More! Discussion in 'Maple Updates' started by Nexon, Dec 28, 2017. December 27 to January 23 in the Special Promotions > New Arrivals category in non-Reboot worlds only. Behold the Golden Apple, a special item that will give you one random in-game item when you open it! It also gives you 10 Apple Pies, which restore 10,000 HP when consumed. Purchase a bundle of Golden Apples, and open them up to see what treasures you can find! Click here to read more about the Golden Apple! December 27 to January 9 in the Appearance category in both Reboot and non-Reboot worlds. Check out the Male Hairstyles available now: Plush Hair (NEW! ), Cello Hair (NEW! ), Wanderer Boy, Tied Two-Tone Hair, Bleached Tie-Up Hair, and Overgrown Hair. Check out the Female Hairstyles available now: Bubble Tea Hair (NEW! ), Mini Horn Hair (NEW! ), Soprano Hair, Uptown Hair, Antennae-For-Girls, and Flower Bun Hair. Check out the Male Face Styles available now: Catty Face (NEW! ), Illium Face (NEW! ), Neatly Kempt Face, Baby Face, Teacher's Pet Look, and Sparkling Face. Check out the Female Face Styles available now: Catty Face (NEW! ), Illium Face (NEW! ), Still Eyed Face, Marble Eyes, Elegant Lady Face, and Big Beady Face. December 27 to January 9 in the Special Promotions > Limited Time category in non-Reboot worlds only. Take home this furry little Polar Cub pet! It comes with an equip to wear, pet food to eat, a Pet Name Tag, and some useful pet skills and scrolls. December 27 to January 2 in the Special Promotions > Limited Time category in both Reboot and non-Reboot worlds. Dress up like a cute little elephant when you wear this package of permanent items! December 27 to January 9 in the Special Promotions > Limited Time category in Reboot world only. Take home this furry little Polar Cub pet! Let this little buddy join you on your adventures in Reboot world! Twelve Days of Beauty continues on December 27 with a special deal on a Hair Color Coupon (VIP)! Take this coupon to a hair stylist to change your hair color and make a fashion statement! Hair stylists can be found in most major towns. You have until 11:59 PM Pacific on December 27 (2:59 AM EST / 8:59 AM CET / 6:59 PM AEDT on December 28) to purchase this item at a discount! Twelve Days of Beauty continues on December 28 with a special deal on a Beauty Album Hair Slot Expansion! Use this to expand the number of hair slots in your Beauty Album by one, allowing you to save one more hair style! You have until 11:59 PM Pacific on December 28 (2:59 AM EST / 8:59 AM CET / 6:59 PM AEDT on December 29) to purchase this item at a discount! Twelve Days of Beauty continues on December 29 with a special deal on a Beauty Album Face Slot Expansion! Use this to expand the number of face slots in your Beauty Album by one, allowing you to save one more face style! You have until 11:59 PM Pacific on December 29 (2:59 AM EST / 8:59 AM CET / 6:59 PM AEDT on December 30) to purchase this item at a discount! Twelve Days of Beauty continues on December 30 with a special deal on a Hair Style Coupon (VIP)! Take this coupon to a hair stylist to change your hair style and make a fashion statement! Hair stylists can be found in most major towns. You have until 11:59 PM Pacific on December 30 (2:59 AM EST / 8:59 AM CET / 6:59 PM AEDT on December 31) to purchase this item at a discount! [Update] Previously, the description below indicated that the items would be sold at a discount. The Transparent items below will not be sold at a discount. This was an error in the description text and it has been corrected. Twelve Days of Beauty continues on December 31 with a special sale of Permanent Transparent Equip Covers! Do you have some amazing items that boost your stats…but that prevent the world from seeing your smiling face? Transparent equips are the answer! These permanent equips render your regular equips invisible—so you can keep getting those stat boosts but also maintain your amazing style! You have until 11:59 PM Pacific on December 31 (2:59 AM EST / 8:59 AM CET / 6:59 PM AEDT on January 1) to purchase these items! Twelve Days of Beauty continues on January 1 with a special deal on a Face Coupon (VIP)! Take this coupon to a plastic surgeon to change your face style and become a whole new you! Plastic surgeons can be found in most major towns. You have until 11:59 PM Pacific on January 1 (2:59 AM EST / 8:59 AM CET / 6:59 PM AEDT on January 2) to purchase this item at a discount! Twelve Days of Beauty continues on January 2 with a special deal on a Skin Coupon! Take this coupon to a skin care shop to change your skin tone to something different! Skin care shops can be found in most major towns. You have until 11:59 PM Pacific on January 2 (2:59 AM EST / 8:59 AM CET / 6:59 PM AEDT on January 3) to purchase this item at a discount! December 20 to January 2 in the Special Promotions > Limited Time category in both Reboot and non-Reboot worlds. Each MVP Surprise Style Box holds a popular random permanent equip! There are 50 different permanent items available! In non-Reboot worlds, you can trade these style box items with other players through the Cash Item Trade window, if you haven’t equipped them. Right-click on a character to see the menu. Check out some of the amazing items you can get from the MVP Surprise Style Box! Evening Orchid Hoodie, Dreams Within Dreams, Sweepy Orchid, Evening Orchid, Dark Devil Horns, Dark Devil Coat, Dark Devil Boots, Dark Devil Gloves, Giant Dark Devil Wings, Polar Bear Hood, White Female Fur Coat (F), Giant Bright Angel Wings, Nerdy Glasses, All About Black, Ink-and-Wash Thought Bubble Ring, and Ink-and-Wash Painting Name Tag Ring. December 20 to January 2 in the Special Promotions > New Arrivals category in Reboot world only. Open the Surprise Pet Box (available exclusively in Reboot world) to obtain one random pet! It contains both 90-day and permanent pets. Take home a permanent Brown Alpaca, Weird Alpaca, White Alpaca, Lil Evan, Lil Aran, Lil Phantom, Lil Luminous, Lil Mercedes, or Lil Shade. Get a special new look for the holidays! Take your Christmas Royal Hair Coupon to NPC Big Headward in Henesys Hair Salon, or your Christmas Royal Face Coupon to NPC Nurse Pretty in Henesys Plastic Surgery to get your new style! You can preview the styles by double-clicking on the coupon in the Cash Shop. Check out the Male Hairstyles available now: Kai Hair (NEW! ), Argent Hair, Billionaire Hair, Alpha Hair, Spiky Bangs, Wild Wolf Hair, Parted Cut Hair, Lotus Hair, and Frosty Hair. Check out the Female Hairstyles available now: Luxurious Locks (NEW! ), Wonder Bunny, Fairy Queen Titania, Princess Roll Hair, Tangy Top Hair, Muse Hair, Roly Poly Hair, Royal Twin Tails Hair, and Lively Waved Hair. Check out the Male Face Styles available now: Calm Odd Eye, Dewy-Eyed Face, Sesame Face, Onmyouji Face, Lotus Face, Lucid Face, Sweet Face, Beautiful Face, and Jay Face. Check out the Female Face Styles available now: Calm Odd Eye, Aria Face, Sesame Face, Olivia Face, Orchid Face, Lucid Face, Puppy Eyed Face, Round Eyed Face, and Yuna Face. December 20 to January 9 in the Special Promotions > Limited Time category in both Reboot and non-Reboot worlds. Ongoing beginning December 20 in the Appearance > Beauty Parlor > Face category in both Reboot and non-Reboot worlds. Use the new Carta's Blue Pearl item to hide your Flora ears (if you’re an Illium character), or sprout Flora ears if you’re a different character. If you want to return your ears to their original appearance, you'll need to make a second wish with an additional Carta's Blue Pearl item. December 20 to January 2 in the Special Promotions > Limited Time category in non-Reboot worlds only. Take home this little Ice Knight pet—a human being who was transformed into an Ice Knight by the Black Mage! It comes with an equip to wear, pet food to eat, a Pet Name Tag, and some useful pet skills and scrolls. Take home this beautiful Crystal Rudolph pet, which projects an aura of nobility and gentleness! It comes with an equip to wear, pet food to eat, a Pet Name Tag, and some useful pet skills and scrolls. Celebrate winter with this little Snowman pet! It comes with an equip to wear, some pet food to eat, a Pet Name Tag, and some useful pet skills and scrolls. December 20 to January 2 in the Special Promotions > Limited Time category in Reboot world only. Take home a frosty winter pet such as the Ice Knight, Crystal Rudolph, and Snowman. Let these little buddies join you on your adventures in Reboot World! December 13 to January 2 in the Special Promotions > New Arrivals category in both Reboot and non-Reboot worlds. Penguin Hood (M), Penguin Doll Outfit (M), Legendary Fish Man, Penguin Gloves (M), Penguin Hood (F), Penguin Doll Outfit (F), Penguin Gloves (F), Beanie Headphone, Snow Earrings, Vintage Muffler Jacket, Piggyback Snowman, Violet Heart Beanie, Snowflake Scarf, Seal Pillow, Snowflake Knit, Sky Blue Goggled Beanie, Snowman Padded Jacket, and Blizzard Stick. December 6 to January 2 in the Special Promotions > Discounted category in non-Reboot worlds only. Expand that inventory with 8-Slot expansion coupons! December 1 to January 2 in the Special Promotions > Limited Time category in non-Reboot worlds only. The holiday season is here! Open a Holiday Surprise Box (either small or large) to receive one random Cash item. The boxes contain such items as cubes, scrolls, Gachapon Tickets, pets, and more. Pick up a Holiday Store Permit that opens a Christmas store! You can open it anywhere in the Free Market and sell up to 24 items at once. Available for a limited time only! December 1 to January 2 in the Special Promotions > Limited Time category in both Reboot and non-Reboot worlds. Get in a festive holiday mood with these permanent winter-themed effects! Double-click the icon or assign a hotkey to turn the effect on/off. Pick up these wintery weather effects that are just right for the season! Snowflakes, Sprinkled Presents, Snowy Snow, and Holiday Sock display graphics on the map where your character is for 30 seconds. Flurry Snowman, Tree Trimmings, and Wooly Winter Knit give Weapon ATT/Magic ATT +30 to everyone in the map for 15 minutes. You can enter a message of your choice. Each weather effect has a 7-day duration.